This can be seen in the example below. It dries with a soft bloom and produces a velvety finish but is quite fragile and is not washable. As a result it is not recommended for areas of heavy traffic. 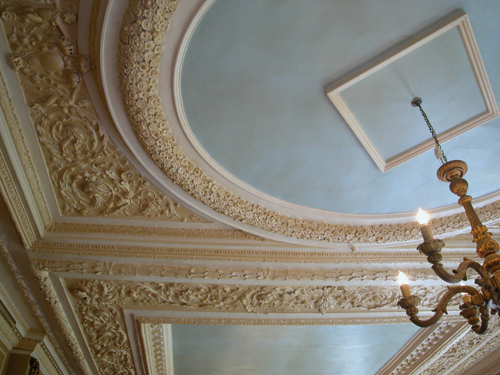 It is ideal, however, for the decoration of elaborate plaster ceilings (such as the one below), where a heavy build up of paint is to be avoided. There are many different recipes for soft distemper and although the main ingredients are constant the proportions often vary considerably. If you are tempted to try making it you must be prepared for trial and error, adjusting the mix to suit your needs. Above all, it cannot be rushed. However, with a bit of experimentation pleasing results can be achieved at little cost. It is worth bearing in mind that a soft distemper has a short shelf-life when in its wet state so only make up as much as you need. From that it will be understood that a true Soft Distemper cannot be bought ready-mixed and that anything in a tin that is labelled as such is unlikely to display the same properties. 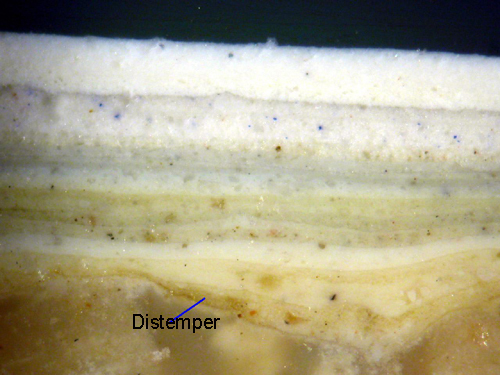 Above all, soft distemper should not be confused with a bound distemper, which has very different properties and which can cause problems in later years. Soft distemper requires a clean, even coloured, non-porous ground. Cracks must be filled and spot-primed with an emulsion paint before proceeding. Distempering over wallpaper is seldom successful and is not recommended. However, if the paper is in good condition reasonable success may be gained by sticking down all loose edges firmly. Even so the distemper may loosen parts which had previously appeared sound. A matt emulsion paint makes a very good base. Stained and discoloured surfaces must be coated with a stain block or primer sealer beforehand otherwise the stains will migrate through the distemper. Previously soft-distempered surfaces must be thoroughly removed by washing down with warm water. The porosity of the surface must be tested before any further work is carried out. If it is unduly porous, the water content of the distemper is immediately absorbed, not only making the brushwork difficult, but rendering it impossible to join up one patch with another without showing coarse brush marks and a double thickness at the joint of the patches. The degree of porosity may be determined by moistening the tip of a finger and applying it to the plastered surface. If the moisture is absorbed within five seconds, a coat of clearcole should be applied. If it remains wet for half a minute this should not be necessary. To overcome the porosity of bare plaster it is customary to apply a coat of clearcole first. This is a medium-strength size to which a little whiting has been added. The size, mixed as in the directions below, should be melted in a double-boiler and an equal quantity of water added. 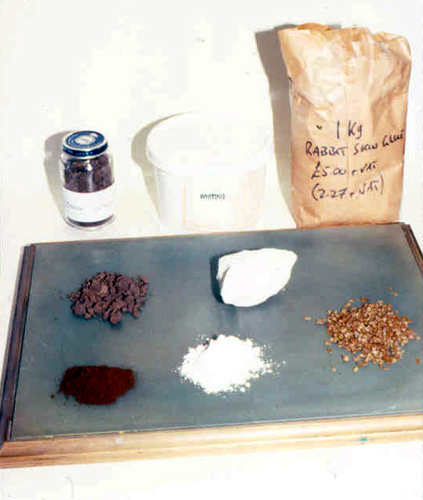 To this is added enough whiting to colour the mixture – in the ratio of 100gm whiting (soaked in water) to 1 litre of size solution. When applied this should appear semi-translucent rather than hiding the surface. Clearcole should be applied hot so that it penetrates the plaster as deeply as possible. Always allow the size to harden before distempering – at least three hours after the surface appears to be thoroughly dry. Soft Distemper is a bulky paint that requires careful stirring in a large container so allowance must be made. Put water into a large plastic bucket. Pour in whiting through a sieve until it peaks a few inches above the water. Cover and leave overnight to ‘fatten’. In a separate container add cold water to the rabbit skin glue in a proportion of one part glue to ten parts water (500g glue to 5 Litres water). Cover it and leave to soak in a cool place overnight. Bear in mind that proportions will vary depending on the type and properties of the glues that you are using. Too little size will mean an under-bound coating and too much will lead to cracking and peeling. When cold it should have the consistency of a table jelly. On the next day carefully pour off the surplus water from the whiting bucket. 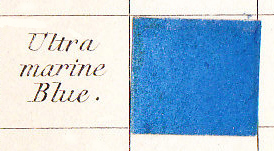 If a white distemper is required add 1 level teaspoon of French Ultramarine pigment and whisk it in. This will counter the yellowness of the size and help to produce a brighter white. If a coloured distemper is wanted the colour should be added at this stage. Powder pigment must be soaked in water beforehand, while universal stainers can be added to the whiting immediately. Stir hard to disperse the colour evenly. Add it cautiously as you can always put more in, but you cannot take it out. Remember that wet distemper is much darker than dry, so test the colour on a piece of card or paper, using a hair dryer to speed drying, before deciding. Once the colour has been obtained spoon the size mixture into a double-boiler and heat until liquid and all the size has dissolved. Do not let the mixture boil. Pour the heated glue into the whiting through a fine sieve in order to remove particles of glue and whisk thoroughly. 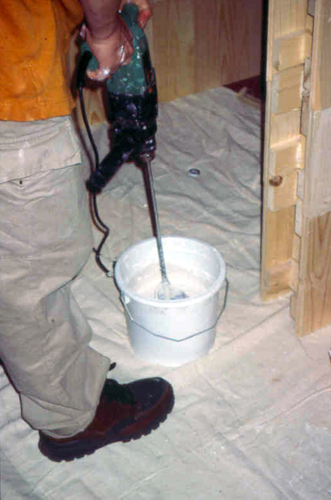 An attachment on an electric drill can make this easier, but a stout wooden spoon can also be used. Allow to stand until cold, when it should have set like a weak jelly, in which a brush will stand – just. The finished paint should be of brushable consistency, but thicker than emulsion paint. 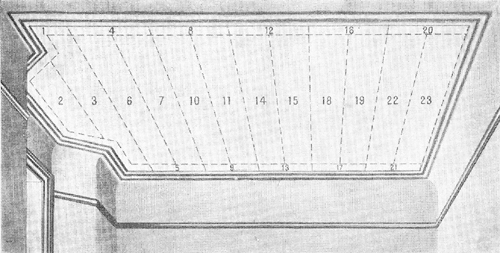 The purpose of adding the glue size is not only to bind the particles of whiting together, but to form a jelly which can be spread on the walls and ceiling with ease. Before commencing work ensure that all furniture, etc., is properly protected by dust-sheets. Shut all windows and doors during application to avoid too rapid evaporation of the water content of the distemper. The brush should be as large as can conveniently be handled, a 4″ – 6″ brush with longish hair being best. Do bear in mind that though a heavy brush will take up more material it will also be more tiring – an important consideration where large areas have to be covered. You will also need a smaller brush for the edges and corners. Cut in with this smaller brush, and “flow” on the distemper using the tip of the large brush. The aim should be to produce a solid, well-covered surface, free from brush marks. There should be no indication of the joint between one patch and another. The distemper should be laid on quickly and evenly – covering an area about two feet in width – from the top downwards. It may be crossed and re-crossed before being laid-off vertically. Ensure that the leading edge is kept wet, and do not stop until the whole surface has been covered. For a ceiling, start at the main source of light (normally the window) and work away from it. Apply the material freely, coating a strip about 1-2ft wide, taking care to keep the edges alive so that the distemper applied to the next section blends into it without showing any laps or joins. Take care, also, that there are no misses, for it is not easy to touch them up later on without a difference in texture being evident once the work has begun to dry. 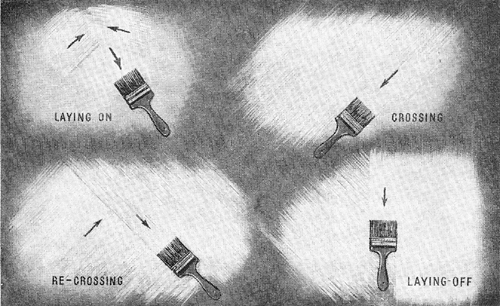 Lightly and freely, swing the brush over the surface making use of only the tips of the bristles. As soon as the wall or ceiling is covered, the windows and doors should be opened wide to allow as much air as possible. One coat should cover although if a second coat is required, it should be a weaker mixture and applied with considerable skill and a soft brush, in order to prevent the lifting of the first coat. Always allow the first coat to harden for about a week before attempting this. 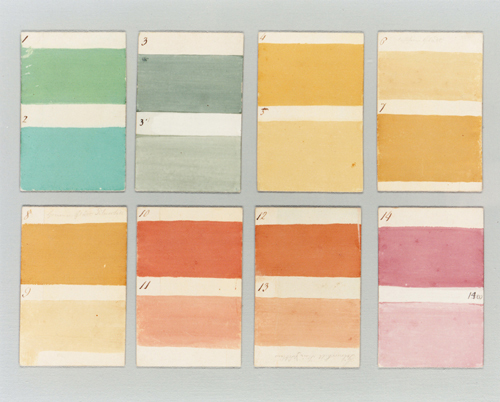 You can read more about this in The Anatomy of Colour, published by Thames & Hudson and available from John Sandoe (Books). Ah ,distemper! Thank God designers are not asking for more of it these days, except, in the cases when distemper is called for with decent reason. Over the years I had to apply it only once in Leighton House, which was a small repair work but never the less, trying. Couple of years later a charmingly grumpy and really funny Irish painter was made by a Interior Designer (who obviously didn’t know much of the specifics of this particular paint and the pain involved in it’s application) to paint a new , super modern flat in distemper. He objected and explained the reason why this choice would be wrong but she insisted . On her next visit she was walking trough the flat admiring the walls and ended up covered in paint, leaving the trail of distressed walls behind. She was furious and embarrassed at the same time. The painter winked at me saying “she had to learn”, (only he knows how painful the application and then washing the same was). Not for a faint hearted. Thank you for an interesting insight into the world of distemper Mr Baty. Much appreciated. Ha! Thank you. Yes, a classic example of the kind of thing that we hear at Papers and Paints all the time. One of the problems is that many designers never get to grips with paint. They consider it messy or too difficult. It’s always very refreshing when one comes across one who has taken the trouble to learn about the component that (generally) forms the greatest part of a decorative scheme. I don’t mind when they ask (that’s what we’re here for) it’s the bluffing that is so irritating. As I wasn’t familiar with the distemper before (in Serbia the lime was the “old way”) that repair job, I had to learn it’s nature and tame the beast right on the spot and finish the job successfully to everyone’s delight (especially my own) in couple of hours. I still remember the cold sweat realising this is NOT like any other paint I ever handled before. Tried different ways of brushing it, without taking it off. I thought, if I treat it gently, with minimal overlapping and keep moving, it might work. It did. Apart from this small intervention I’ve produced all the plinths for Leighton House, ebony and central marble piece which is done in the style of the original marble they had for the first opening of the house to the public. Love the place. As for the mentioned designer, she probably heard about distemper and fancied the name. She’ll do a better research next time. Thanks Zorica. Yes, Leighton House is a wonderful place. We have supplied specially-matched paint for several rooms. Two questions: (1) I’m wondering whether to specify a soft distemper for the Chancel in a Butterfield church. The plastered walls look like they have been painted with a modern emulsion, which is flaking off especially around the windows. The Chancel isn’t an area of high traffic so a fragile paint is probably OK. Do you think soft distemper is a suitable paint in this situation? 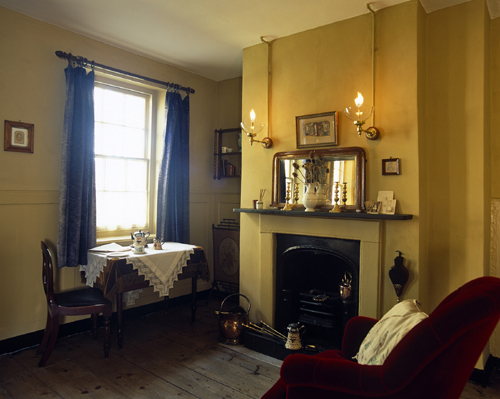 (2) I know limewash can be applied by an unskilled decorator (like me!) but would the church wardens be able themselves to put soft distemper onto the Chancel walls (plain plaster)? Thank you for your enquiry. It’s difficult to say without seeing the surfaces and establishing why the paint is flaking. Soft distemper, if you are prepard to make it may be an option. Limewash would not be an option if you have emulsion on the walls already. It is possible that one of the ‘Classidur’ paints might be the most realistic option.